"Move your bloomin' arse!" screamed the old man with the flat cap. He wore a grey suit jacket with black dress pants and pressed against his eyes he held a pair of binoculars. "Come on Hutchinson, come on! Break, break!" The rhythmic sound of hooves hitting the soft mud grew louder and louder as the clump of horses raced forward towards the finish line. Their speed caught the wind as they neared the end, and before the flat-cap man could scream another syllable, they had passed the finish line. "Who won!?" He threw his binoculars down against his chest. On the big screen, the number 1 flashed. First Mohican had won the race! "Bloody horse," the man mumbled as he stumbled away towards the Totepool, counting the money in his pocket. And so ended the first race of the day. With a total of 7 races, there was a pattern to the course of events: crowds piled near the betting booths and the bars, and when the 2 minute races would start, they filed up into the stands and pressed against the railings, then when the race ended, they would crowd back towards the betting booths and bars. Over and over again, pockets emptied and pockets filled. But betting isn't everything to the races, not for me at least—my money stayed safely in my wallet. The races are an elegant, high-class social event where the women dress in heels and hats and the men wear suit jackets and slacks. Just like any other sport, it's an enjoyable game to watch. In warm-ups, the horses look rather awkward, prancing around with high hooves and flailing their necks, and the jockeys squat on top with their butts wagging high in the air. But their speed is fantastic. When the horses zoom past the spectators stands, it's like they're flying, their hooves barely touching the ground—they just zip by in a stream color, thumping through the mud. The fourth race was the biggest with a winning prize of 106,650 pounds—The Duke of York, it was called. This was the one race I bet on. With friends, of course. Over desert. The deal was, whoever lost the race had to make desert for the others, creating 3 winners and one loser. Between the four of us, none of our horses won, but Liza's horse was injured and fell in last place, never finishing the race. Though my horse still didn't win the race, he did well enough to win me a desert! Thanks Mince! 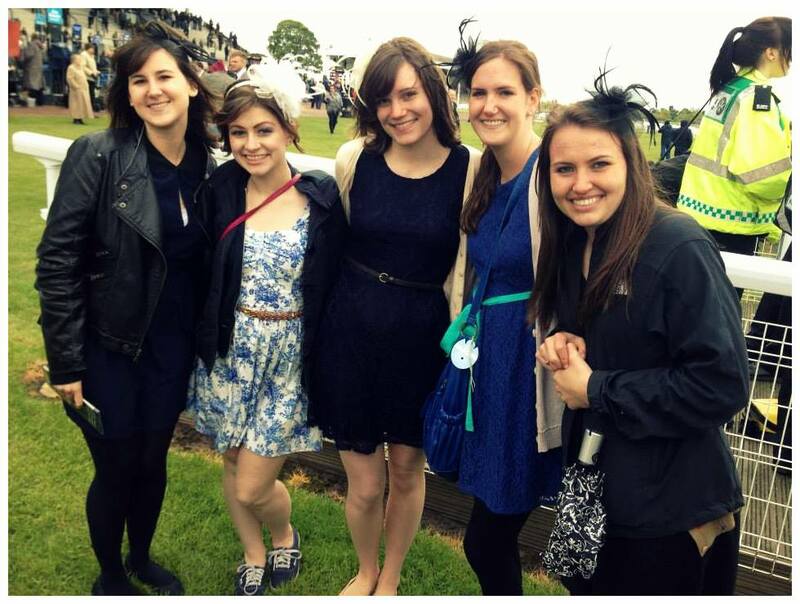 Though a perfectly wonderful day at the races, it had its struggles. I had made the terrible choice of wearing a flowy lace dress on a cold, windy day with a Velcro-flap raincoat. Let me tell you, lace and Velcro is a bad combination, especially on a windy day. I can laugh about it now, but it wont happen again. With scones and Yorkshire tea in the morning, the horse races in the afternoon, and rain, rain, rain, it was the perfect British day. And I still have money in my pocket, mostly.